Gramophone: outstanding; Penguin Yearbook 2004 3 stars, outstanding. Queen Elizabeth’s reign (1558-1603) was a golden age for the arts. England enjoyed a growing cultural exchange with continental Europe. England’s rich, but essentially conservative pre-Reformation heritage was infused with increasing continental influence and innovations. Elizabeth I was the fourth monarch to sit on the throne in Thomas Tallis’s lifetime. From the outset of her reign Elizabeth allowed considerable freedom of practice and belief. She was firmly in favour of a vernacular liturgy for the general population, although in her own chapels she preferred a more lavish ceremony to music. Tallis had witnessed the wholesale destruction of much of England’s church music tradition, however the ever adaptable composer met the challenges of a new liturgy, its new styles and genres, with the imaginative force of a man half his age. The years of Reformation, and Elizabeth’s protestant settlement, freed the Latin-texted tradition of liturgical propriety, allowing composers to reinvigorate the language and harness it to new, expressive and personal ends. 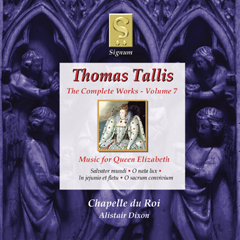 This recording presents Tallis’s Elizabethan Latin motets (which number fifteen). The mighty occasional piece, the forty-voice motet Spem in alium, concludes the disc.